Please refer to our stock # 614 when inquiring. Finest painting of brush-stroked and feathered brows and her closed mouth has defined space between the shaded and outlined lips . She has on typical dimpled chin and pierced ears . 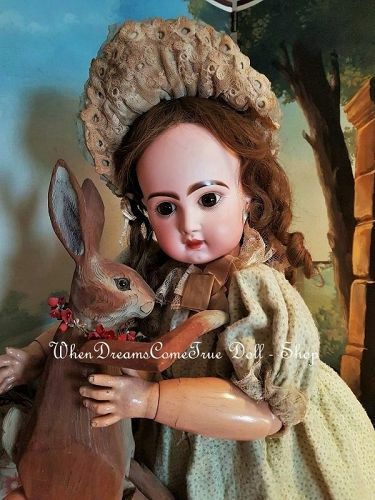 Pretty brown human hair wig by Jumeau over cork pate and her original early French composition and wooden body has original body finish and plump limps. Here condition is generally excellent ... the head is free of damage , hairline , chip or repair. Note only a not disturbing fine bisque fold at her neck side with tiny factory imperfection in her bisque .... it was a mold problem .... please ask me about special pictures ! Pretty all perfect Bebe .... ready to enjoy in your good collection !! She comes with her pretty silk parasol , which fit matching to her pretty outfit !! Please let me know if you need more or special pictures or if you have any question !! Thank you for your interest on my Doll - Shop ! !